We specialize in wholesale coffee to restaurants, cafe's, hotels, specialty retailers & consumers throughout the United States. Can I place an order over the phone or by fax? I'm sorry we do not accept orders over the phone and or by fax, all orders have to be placed via our website. Do you offer wholesale discounting? I'm a wholesaler in North Carolina, how do I apply for Food Tax Exemption? How long does it take for you to roast and ship my order? We typically roast & ship all orders within 1 business day. However this is not guaranteed, and at times we may require an additional 1-2 days to fulfill an order. Do you sell decaffeinated coffee? Yes, our espresso, all our flavored coffee and many gourmet coffees are available in decaffeinated. 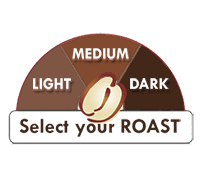 Below each coffee look for the "Type" option if available you will be able to change it from regular to decaffeinated. Can you grind my coffee for me? Yes, all our coffee's can be ordered in ground or whole bean. Next to the coffee it will be listed as an option which you can select. What type of ground coffee do you offer? If you select to have your coffee ground, we use a universal grind on all our Gourmet & Flavored coffees except for our Espresso which is a finer espresso grind. We always recommend ordering whole beans if you can. By ordering your coffee in whole bean form you help extend its shelf life by grinding only what you need when you need it. You also can fine tune the coffee grind to your liking and or your coffee brewer. Do you have a quick ordering system? No, I'm sorry we do not. This would be another expense that would raise our prices and we strive to keep them as low as possible. Do you sell single serve coffee cups? What is the compatibility of your single serve coffee cups? San Marco Coffee, Inc. has no affiliation with Keurig® or K-Cup® Keurig® and K-Cup® are registered trademarks of Keurig Green Mountain, Inc.
Why is only the box and not your single serve coffee cups individually labeled? It is high on our wish list to be able to label them individually like we do our bagged coffees. Unfortunately, there is no printer on the market that can print on the labels directly in the way we manufacture them. Our single serve Fresh Cups are made-to-order but we are working hard to overcome this challenge and hope to have a system in place to be able to label them individually soon! Can I convert my Guest account to a Registered account? Yes, simply use the "Forgot your Password?" link on the Sign in page. Then once you receive the email with the temporary password, sign in and our system will then convert your guest account to a registered account automatically! How would I update my password, email and or address information? Simply sign in to My Account and you will be able to make these changes. What forms of payment do you accept for U.S. & Canada orders? Can I make a purchase using Bitcoins as payment? Yes! We accept bitcoins as payment for all U.S. and International orders. My credit card was declined, but I was still charged? This can happen if your credit card issuer approved the transaction, but our payment processor declined the transaction (usually due to a CVS and or address verification mismatch). Since the card was declined, the transaction will not be completed and the pending charge will disappear from your bank statement automatically usually within a few business days. What shipping carriers can I choose from? UPS, & United State Postal Service! Yes! However please make sure you select United States Postal Service as your shipping carrier because UPS does not ship to these addresses. If your order is being shipped to a PO Box, APO or FPO address and UPS is selected it may be delayed, canceled and or subject to additional shipping charges. How do I contact San Marco Coffee? How do I track an order that has been placed online? or Simply sign in to My Account and click on the button next to the order. Do you export outside of the United States? What are the Customs and or Restrictions on exports? If you fail to obtain accurate, and or specific Customs information in advance of placing an order. If the goods ordered are prohibited or restricted within your country, whether or not we warned you about Customs issues with respect to your order. If Customs seizes your order. If Customs imposes tariffs, surcharges, fees, fines, and or any other penalties against your order. Do you have a La Spazilae parts catalog? Are there additional details about Gift Certificates? Yes, this is one of our ways to give back and help support our troops. If you have an order shipped directly to a APO/FPO address a 5% discount will be given automatically at checkout! How many flavors does San Marco Coffee have? San Marco Coffee currently produces 290+ flavors of coffee.